Last week I was photographing a major gymnastics competition, the Gymnastics World Cup competition held in Melbourne, Australia. I’ve shot a fair amount of gymnastics in the last year – from recreational gymnasts through to some of the world’s best. 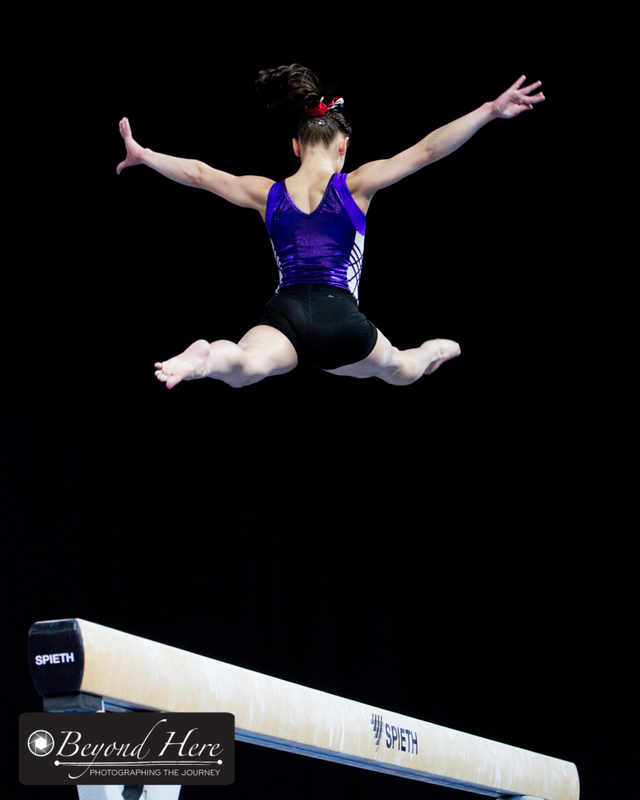 Here are 5 thoughts from photographing a major gymnastics competition. Photographing a World Cup event is very different than shooting recreational gymnasts at the local club. The strength, flexibility, and balance of the top gymnasts is quite amazing and leads to unique images that can’t be produced with less capable athletes. So, thought number one from photographing a major gymnastics competition is that subject matter matters. If you want to shoot really unique images, it helps to start with subjects who can do unique things. In the women’s beam competition there were 9 photographers located to the right and back of the image above. They were literally on top of each other shooting the same subject from the same angle (I took a photo of them to amuse myself). While there is an argument that there is a “best position” to photograph each apparatus, be brave enough to be different. I stood on the opposite side of the floor. It meant I didn’t have a great shot of the women’s beam competition, but I was the only photographer shooting the men’s vault. Vault is difficult to shoot so many photographers decided not to. I like the opportunity to shoot unique images. Be brave. Be different. Gymnasts wear unique clothing for their competitions. They range from simple all black or all white, through to multi colored and patterned designs. Looks for bold colors to help create strong images. Particularly look for reds and blues. Bold colors will help your images stand out. At some gymnastics events there are multiple apparatus going at one time. In that case you have to choose which one to shoot, or get lucky and find a position where you can shoot multiple apparatus from one location. At this event, there were only 2 apparatus operating at one time. That made it easy to make sure you created variety in your images by shooting different activity. It reminded me to shoot a range of apparatus so your images don’t all look the same. That’s thought number 4 from photographing a major gymnastics competition. At a big sporting event there are lots of people and lots of activity. There are many compelling images waiting to be made from people other than competitors. 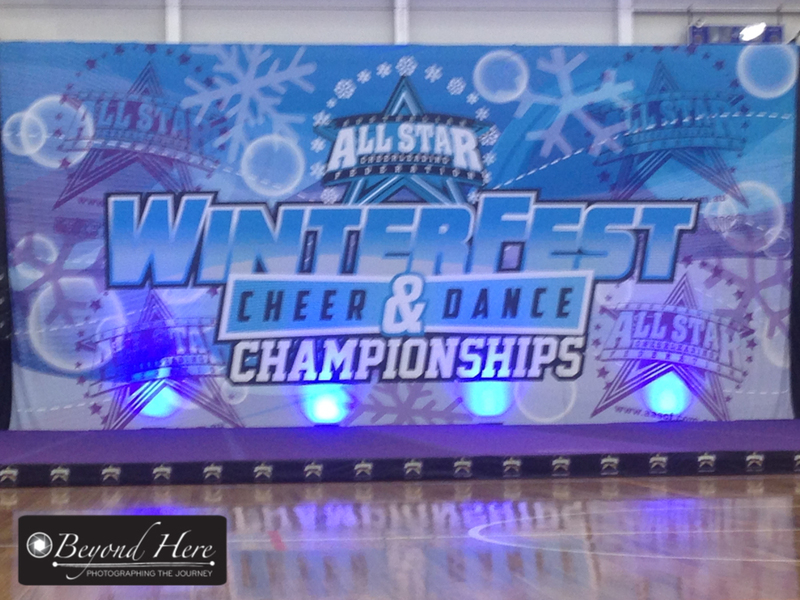 Keep an eye out for judges, coaches, spectators, and other people involved in the event but not directly competing. Shooting these images well will guarantee you produce unique content. 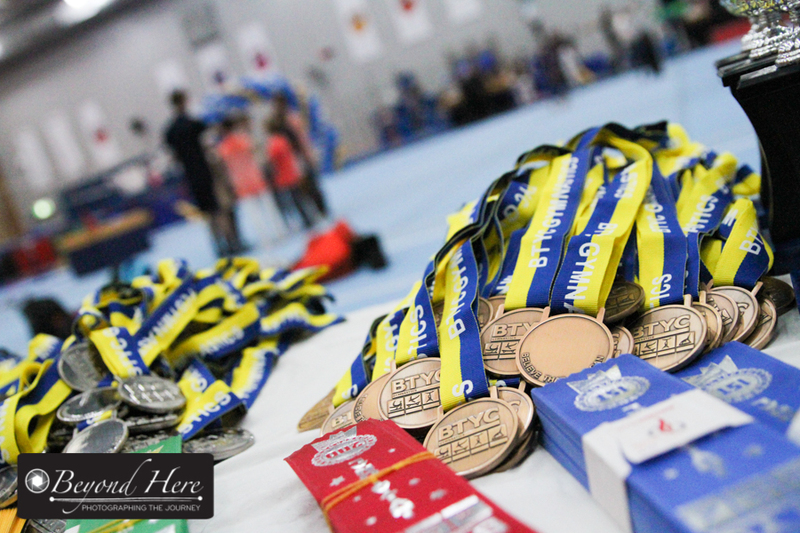 Thanks for reading Thoughts From Photographing a Major Gymnastics Competition. This entry was posted in Sports and tagged gymnastics, photography tips, sports, sports photography on February 27, 2019 by Craig Dingle. 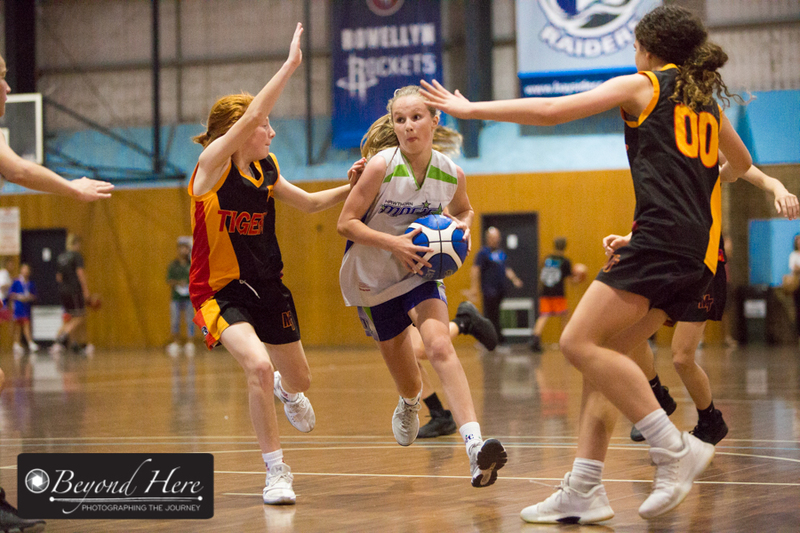 Last month we photographed the Southern Peninsula Junior Basketball Tournament. It is an annual tournament held in November just before the start of the rep basketball season. 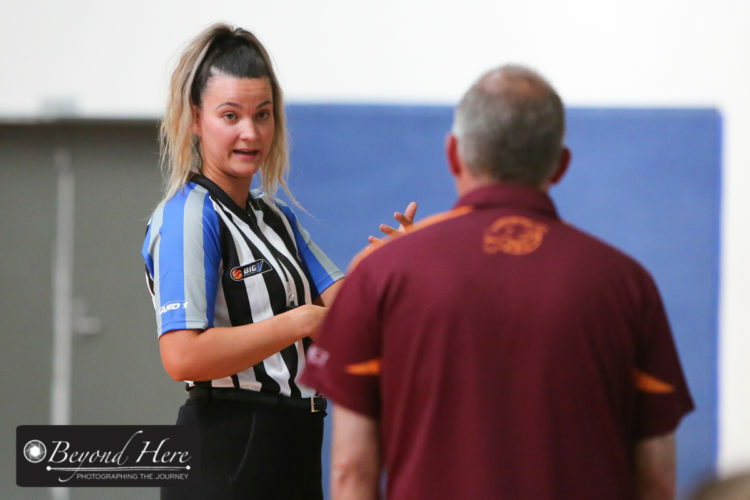 This year the tournament featured 440 teams and was held at 14 stadiums and 34 courts around the Mornington Peninsula, Victoria. Those numbers speak for themselves – it is a very popular tournament with over 4000 players participating. My understanding is that this is the first time the tournament has partnered with a professional photography business. The under 12’s featured 107 teams and over 1000 players. It was quite a challenge photographing 1000 junior basketball players. How did we manage that? We had 6 photographers across multiple venues on the Saturday and Sunday of the tournament. We aimed to shoot each team at least once, and photographed 70 games over the 2 days. 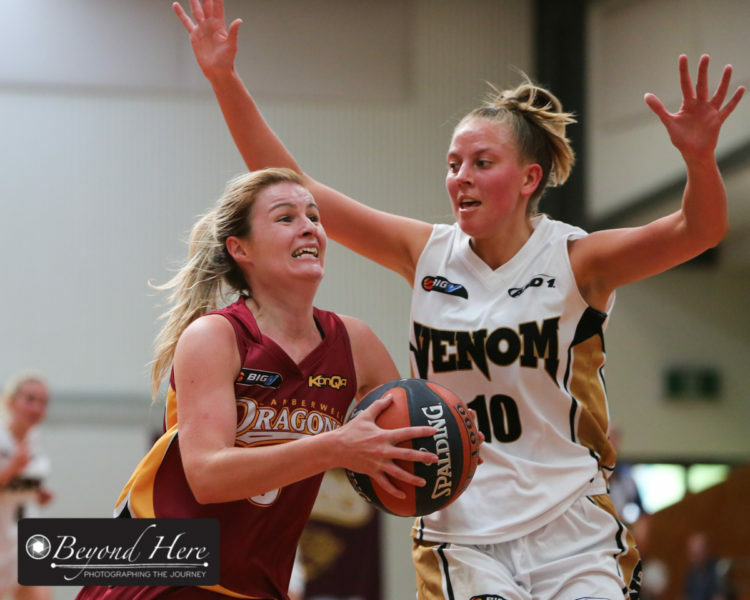 That resulted in close to 10,000 action portraits featuring everything from young players new to representative basketball, through to some of the best under 12 players in the state. Behind that was a lot of planning and scheduling about which photographers needs to be at what location shooting which game. I won’t sugar coat this – the planning was a very significant logistical challenge. How was the lighting in the stadiums? Tournament play was on 34 courts in 14 different stadiums. Some stadiums are new and well lit while, on the other hand, others are 30+ years old with no natural light. We were aiming to shoot at 1/1000s to freeze the action. To achieve that we were shooting at high ISO – up to ISO8000 in one very dark stadium. It is amazing that today’s modern cameras can shoot fast moving action in this environment. It was fun to see the kids in action, and a thrill to see them excited about the photos. Prints and digital downloads are available to order through password protected online galleries. The galleries are open for another 2 weeks and already it is a nice surprise to see how how popular prints are. I’ll save more of that for another Beyond Here post. Hooray for prints! It was great to work with a strong team of photographers and reassures me that we can tackle bigger sporting events in the new year. Thanks for reading ‘Photographing 1000 Junior Basketball Players’. 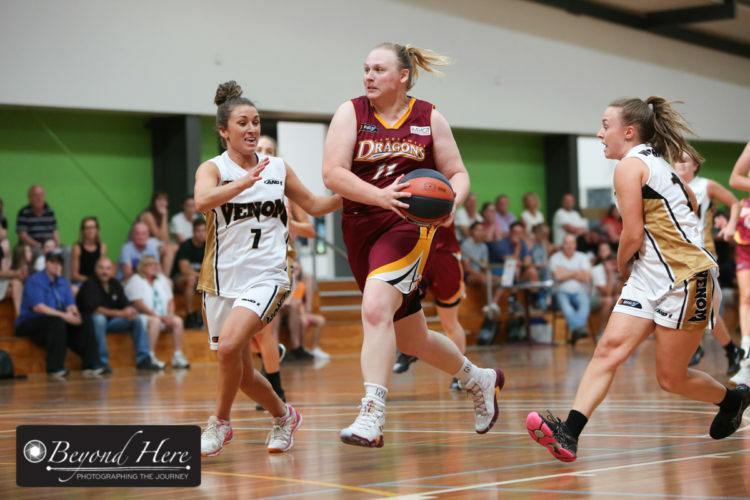 This entry was posted in Sports and tagged action, basketball, event photography, sports, sports photography on December 3, 2018 by Craig Dingle. 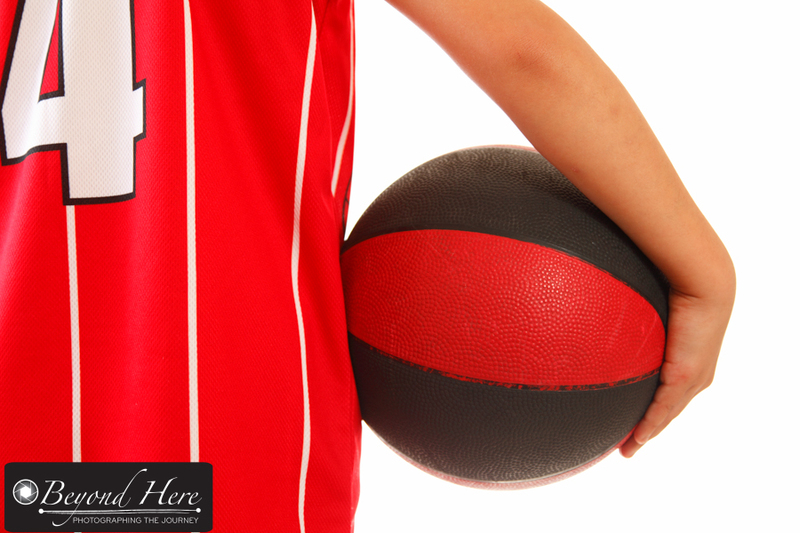 Later this month I will be shooting a large junior basketball tournament. It’s run over a weekend and is very popular tournament. 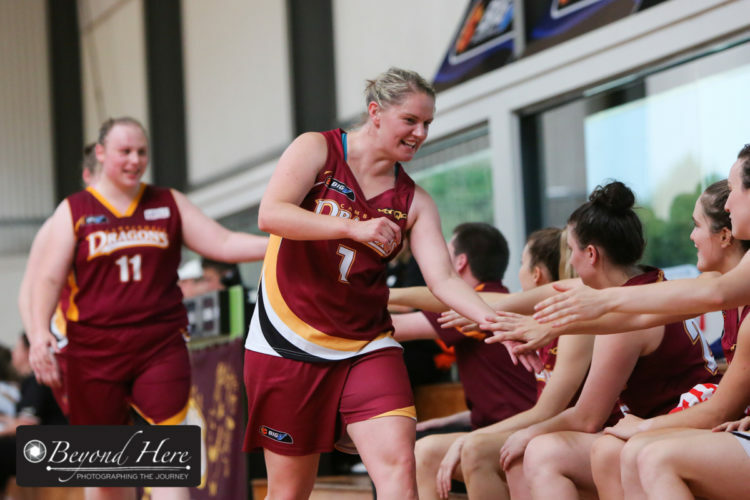 The dates are the week before the representative basketball season starts making it an ideal preparation for the season ahead. I’ve been looking for several photographers to help across one or both days. This hasn’t been a smooth process! So, for all the photographers out there, here are some suggestions when applying for photography work. I posted a job ad on Starnow outlining that I am looking for sports photographers. It clearly outlines the dates of the job, yet I have had some photographers apply without being available for the specific dates. It isn’t much good applying for a job when you are not available. Check dates and availability before you apply to avoid wasting time. 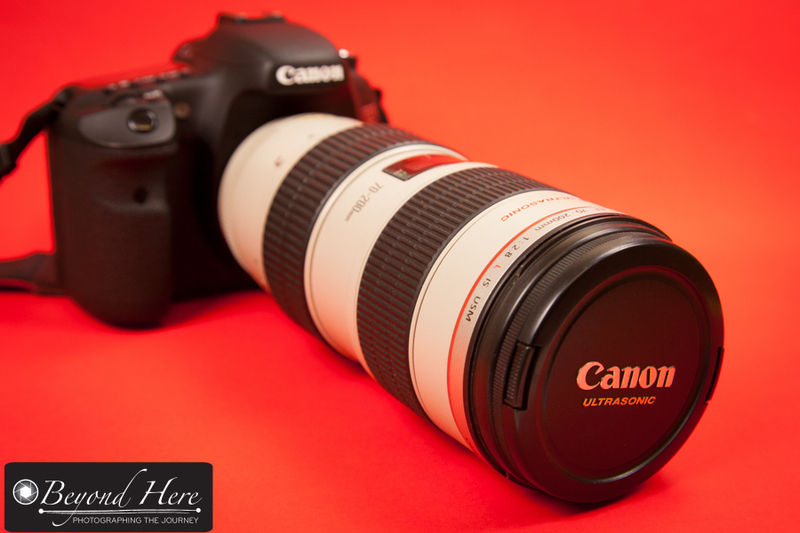 For this shoot, photographers will need to provide their own equipment. I want to know that the photographers are using camera bodies and lenses which can produce good quality images in indoor stadiums. To all the applicants credit, they have all outlined the equipment they will use. That has reassured me they are using equipment which has the capacity to produce the quality needed. This job is photographing players under the age of 18. For that reason I’ve advised that photographers will need to have a current Victorian Working with Children Card. I’m really surprised that some photographers don’t have one, and yet still apply for the role. I’ve responded to them immediately advising that they can’t be considered for the role without one. I also ask that photographers have their own public liability insurance. If something goes wrong they won’t be covered by my insurance. Again, there are people applying for the role without insurance. You will struggle to convince me that you are a professional photographer operating a business without insurance. If you want to get regular photography work, have the basics in place – insurance and working with children permits are important. Having them will open up many more opportunities for you. Go ahead and get them in place. Several of the applicants would like to get into sports photography or have done a small amount of similar work. That’s not what I’m after for this job. I need people who I know can do the job, because they have done it plenty of times before. If you want to immediately establish your credibility, and reassure the job poster that you can do the job, provide a link to an online portfolio of related work. With a job which is two weeks away, it’s in everyone’s interest to communicate quickly and clearly. If an applicant doesn’t respond for several days, I will assume they are not very interested in the job. On the other hand, if they respond very promptly and make themselves available for a face to face meeting in the near term, that demonstrates a level of commitment and a willingness to take on the work. Respond promptly. 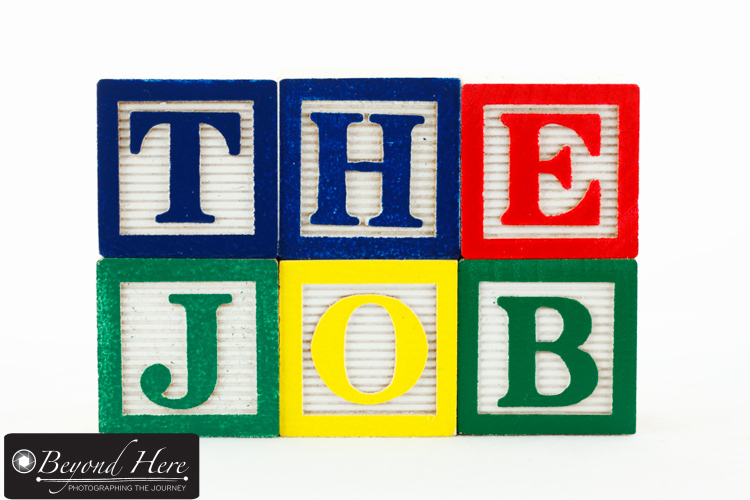 It will impress the job poster and make organizing the job easier. At this event, the photographers will be representing themselves and also my business. I want to know they will treat the players, officials, and spectators appropriately. That will include displaying a high level of professionalism. It won’t help your credibility if your communication is unprofessional from the outset, so take the time to make sure all of your communication is professional. There are not a lot of photographers out there who have shot lots of junior basketball. That said, it is worthwhile outlining other relevant background. For this type of job, if you have photographed other fast moving indoor sports that is worth mentioning. If you have played and watched a lot of basketball, that is worth mentioning too. Both elements would increase my level of confidence that the photographer can do the job with minimal supervision. Thanks for reading Suggestions When Applying for Photography Work. I hope it is helpful to you. 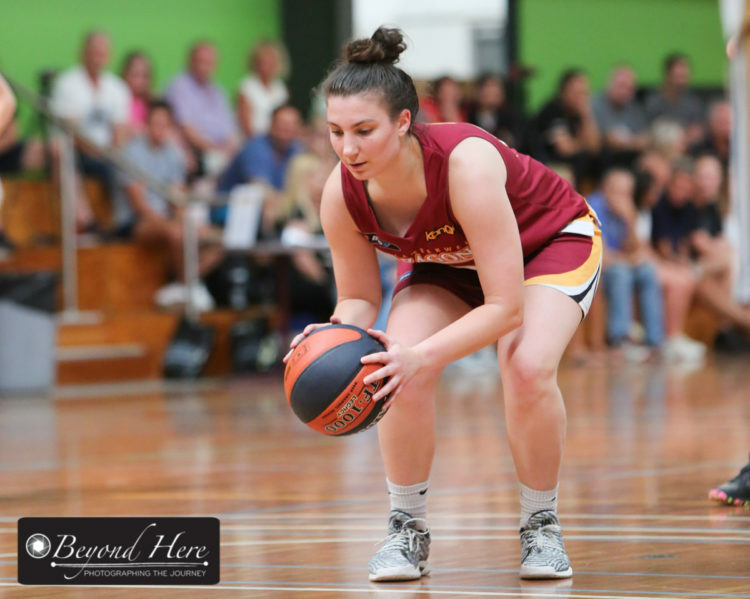 If you happen to be in Melbourne, Australia and would like to shoot some basketball later this month, please make contact! This entry was posted in Craig's Comments, Sports and tagged sports, sports photography on November 5, 2018 by Craig Dingle. I often get asked about secrets or insights to running successful photography businesses. I’m not sure there really are any secrets, so I’ve called this post thoughts on successful photography businesses. 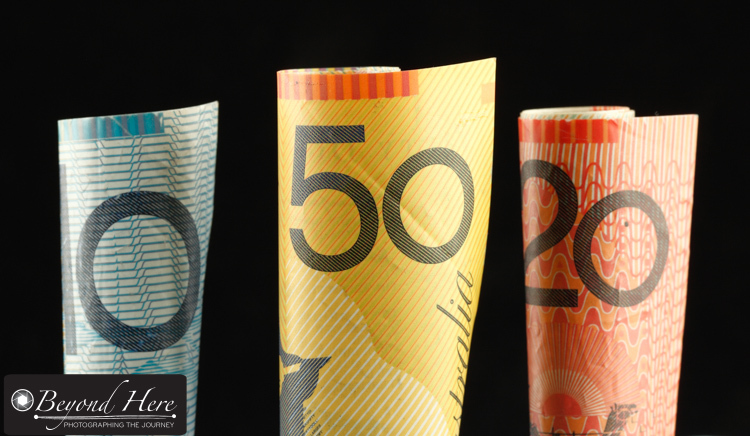 So what are those three thoughts on successful photography businesses? I apologize for the simplicity of thought #1! That said, it is worth repeating and digesting – happy customers are key. I do all I can to make sure my customers are happy as that will lead to referrals and other business opportunities. Most times it is easy to make customers happy. The real test is when things go wrong. In that case I’ll do everything possible to put it right, even if it means I lose money on that job. In this case my ‘customer’ was the national sports photography business I was shooting for. I knew that they needed good, reliable photographers in Melbourne. Doing a good job at the first event I shot for them has lead to a follow up job. Happy customers leads to referrals and also to repeat business. Again, in this scenario, the national sports photography business have multiple events in multiple locations all year round. As it happens, the State Champs are being held at the very same venue as the event I shot with them a few months ago. This will make this job relatively straight forward and definitely low stress. I know the people I’ll be working with, the venue we are shooting at, and the sport we are covering. That’s the beauty of repeat business. From the national sports photography business point of view, they know I’ll do a good job and will be reliable. Win win. At the State Champs I’ll aim to take some phone shots which aren’t quite so blurry! Do you have repeat business opportunities? Can you create some by following up with some of your happy customers? Behind the national sports photography business are people. (Amazing insight isn’t it!) In this case I was able to connect with the owner of the business at the first event and strike up a good relationship. She lives in a different state, and since then all our communication has been via email. She is easy to deal with and a good communicator. I try to be the same in return. It is good for both of our businesses to work on relationships and communication. So, it’s more than just being a good photographer, it’s important to be a good partner. Relationships and communication facilitate that. No genius insights this week – just reminders of good business practices. Thanks for reading thoughts on successful photography businesses. This entry was posted in Business Tips, Sports and tagged business tips, photography business tips, sports, sports photography on September 8, 2018 by Craig Dingle. Earlier this year I wrote a post for Beyond Here called Win Win Win Photography Business Thinking. It came from a meeting with another photographer who had found ongoing photography work that benefited all parties. I continue to look for photography business ideas which have multiple winners. Today I share more win win win photography ideas. I’ve shared in a number of posts that I am shooting more and more sports and in this field we are finding more win win win photography ideas. I have a small team of sports photographers and we are shooting a lot of junior sports. We see an opportunity to bring professional quality photography to grass roots sports and to provide players and families with action shots they haven’t had access to before. In short, we’re aiming to shoot images which make the kid the star of the image, in the same way they have seen their adult sports stars in photographs. 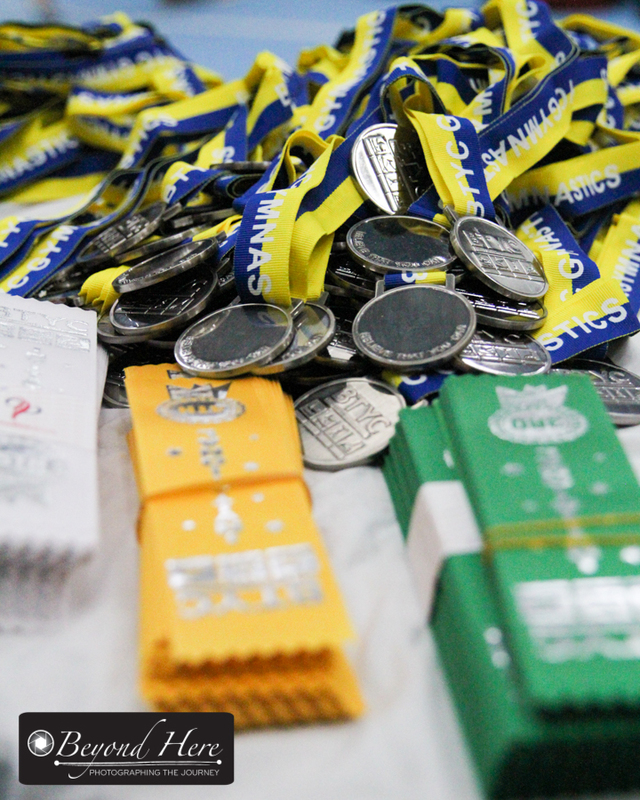 At the same time, we are making the images affordable for the athletes and their families. Some sports are more suitable for than others. Indoor, fast moving sports are particularly good. Why is that? Lighting. Most indoor stadiums are not well lit so it is not easy to create strong images without the right equipment. For that reasons, these sports are not well covered at junior level and we are getting feedback that “we’ve never seen images like these”. Fast Action. Again, sports are not easy to photograph without the right equipment and experience shooting fast moving subjects (see a separate post on that here). Access. Often it is not practical to have spectators walking around the stadium taking photographs and so there are specific areas set aside for spectators. They are not allowed close to the action and have to sit in the grandstand. 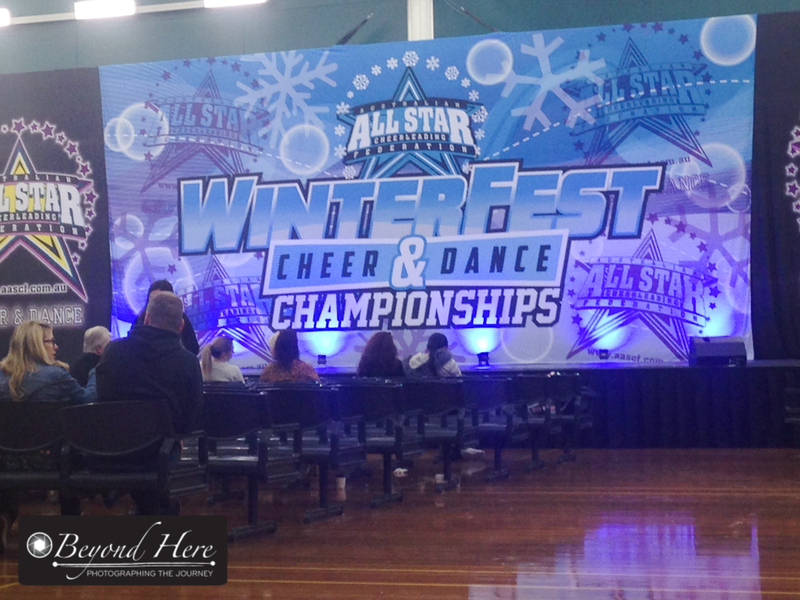 By organizing access to the competition area it’s possible to create action images which are not possible from the spectators area. What’s the Win Win Win? Win #1. The Kids. By using appropriate equipment, shot by an experienced photographer we create high quality action images which kids haven’t seen of themselves before. It is literally bringing pro photography to junior sports. The kids get a thrill seeing themselves in action and are quick to share on social media. Win #2. Parents and Families Value the Images. Parents and families love seeing images of their kids in action too. Keep in mind some are willing to pay for images and some are not. If you can find sports with large participation numbers you will have a greater chance of selling more images. Win #3 . 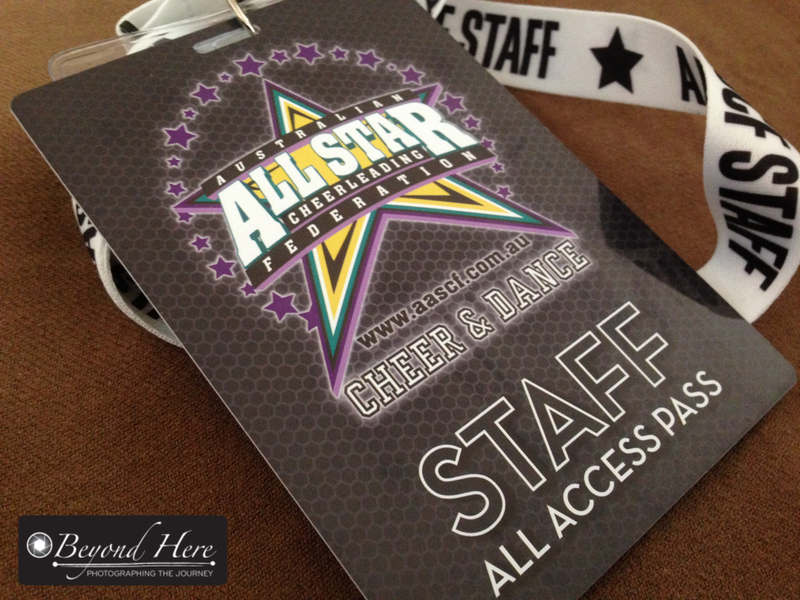 The Clubs or Sports Organizers. The new battlefield for sports clubs is social media. That’s the primary channel they are using to promote their club and to differentiate themselves from other clubs and other sports. Win number 3 is for the club, as we are able to provide images for them to use on social media. Can you come up with more win win win photography ideas? 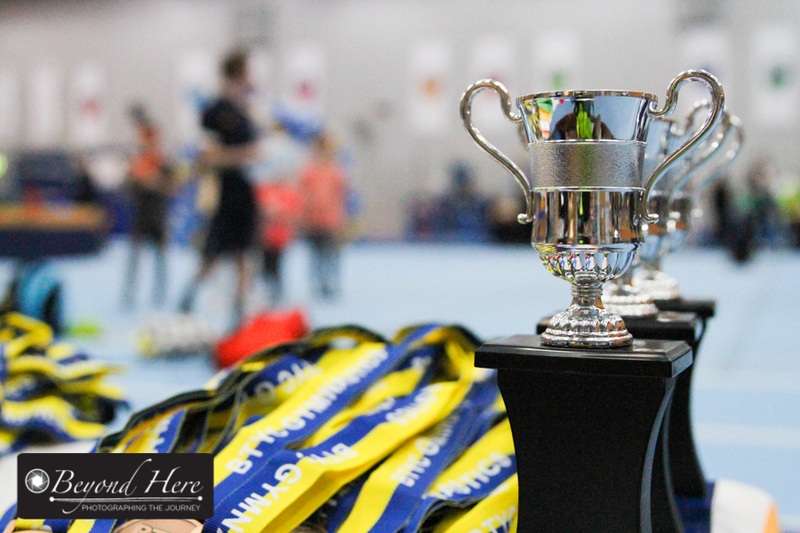 Last weekend we shot a gymnastics event which had 100 kids participating from 4 different clubs. In gymnastics, only the competitors and coaches have access to the event floor. By having 2 photographers on the floor as well we were able to shoot unique images which athletes and families have not had access to before. We shot a large number of images and have posted the best ones in password protected galleries online for parents and families to purchase. This is what I’m looking for – more win win win photography ideas. Can you find similar opportunities? Can you generate more win win win photography ideas? This entry was posted in Business Tips, Sports and tagged gymnastics, sports, sports photography on August 31, 2018 by Craig Dingle. Over the last 2 weeks I’ve been shooting sports events in dark stadiums. First was a fast moving basketball game and second a gymnastics session. Both are fast moving and require you to freeze the action. Here are tips for shooting indoor action sports. The one thing you can’t get wrong when you are shooting indoor action sports is focus. To achieve this you are going to need fast shutter speeds. 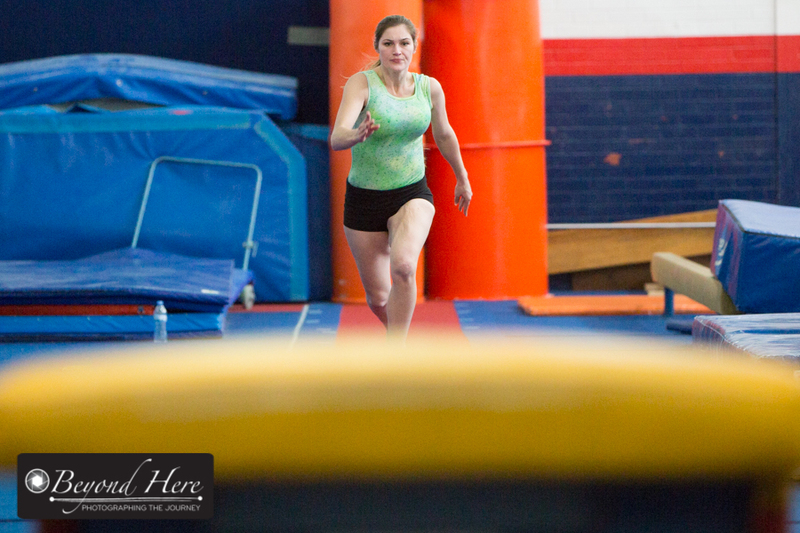 Given that most indoor facilities are not very well lit, tip number 1 is to be prepared to shoot at high ISO. The images in this post were shot at ISO2000 to ensure I had fast enough shutter speeds to freeze the action. 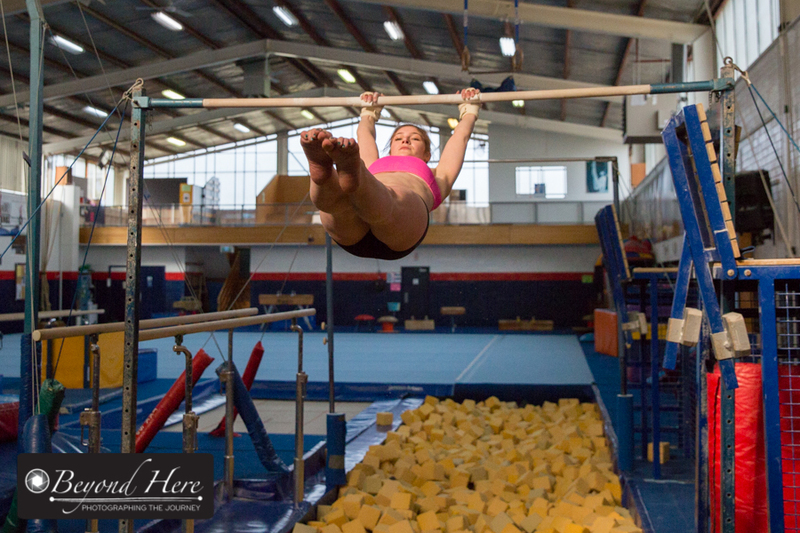 The images in this post were shot at a local gymnastics club. It was difficult to shoot with a background which didn’t take the viewers attention away from the subject, as you’ll see in some of the images in this post. Tip 2 is to look for opportunities to shoot with plain backgrounds. To make this image I went upstairs to a viewing area and shot down towards the gymnast. By doing this I was able to use the plain color of the gymnastics floor as my background, allowing the subject to really stand out in these images. While the background in a gym environment is potentially distracting, it is also very colorful. I made a point of making some images which accentuated the colorful and busy environment. Keep an eye on the colors around you to see if you can create different images. Some of the strongest images from this shoot did not involve fast moving action. We were able to create some images showing the strength, flexibility and balance of gymnastics without action. Here is an example showing the gymnast stretching. Tip 4 is to look for moments without fast moving action. 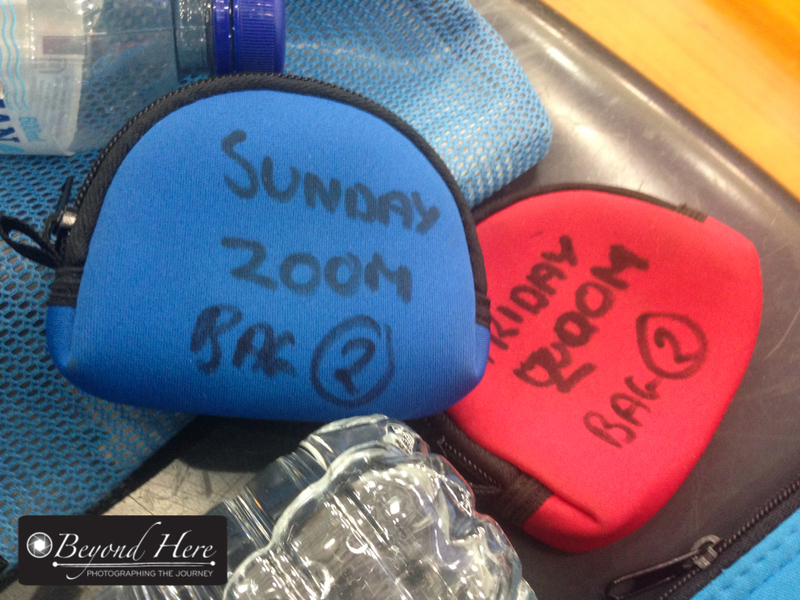 Thanks for reading tips for shooting indoor action sports. Happy shooting. 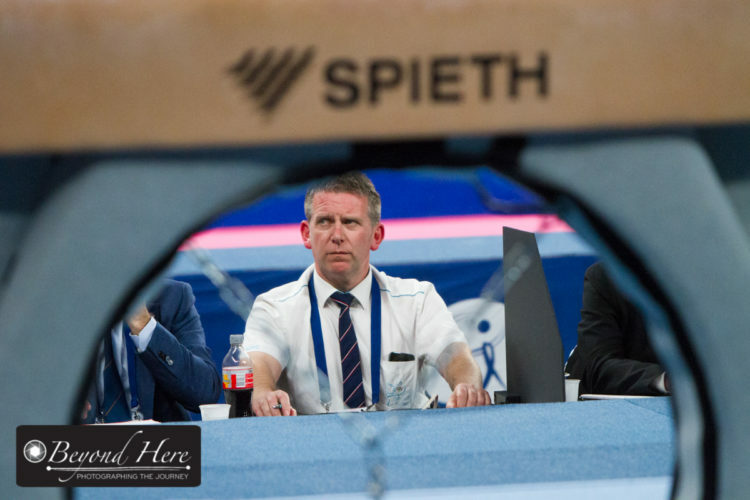 This entry was posted in Sports and tagged gymnastics, sports, sports photography on August 12, 2018 by Craig Dingle. Coming hot on the heels of 5 Lessons from Photographing Gymnastics – here are 5 more lessons from photographing gymnastics. 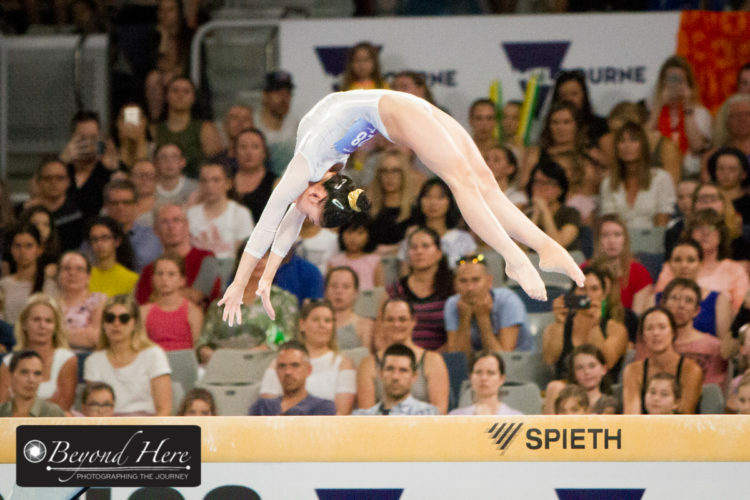 I learned these while shooting the Australian Gymnastics Championships in Melbourne, and hope you can use these in your own sports photography. 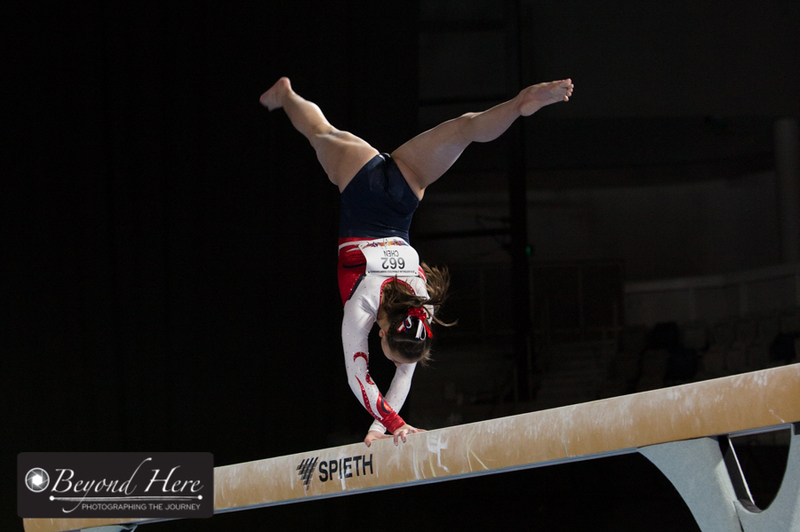 So, what’s first in 5 more lessons from photographing gymnastics? Gymnasts learn different skills at different levels of gymnastics. As an athlete progresses up the levels they can execute more difficult activities. 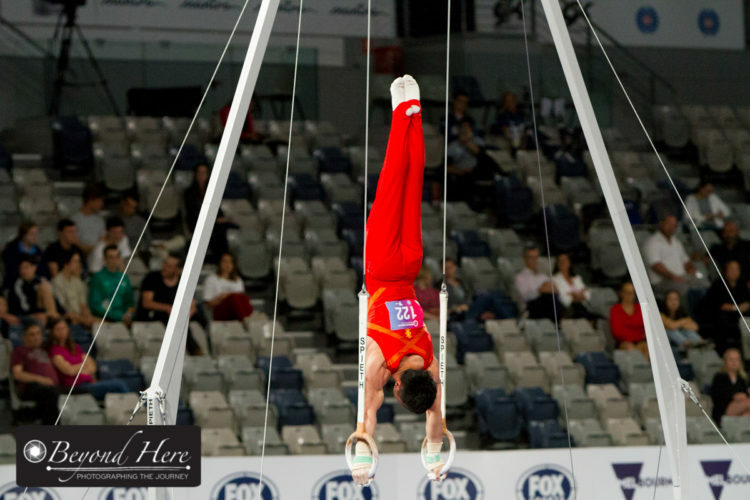 Among the high speed action of gymnastics championships are specific skills. Look to shoot these skills as they are meaningful to gymnasts, coaches, and gymnastics fans. In a gymnastics competition there are lot of opportunities to shoot elements of the event outside of the actual competitive performance. This is where a photographer can shoot very unique content. 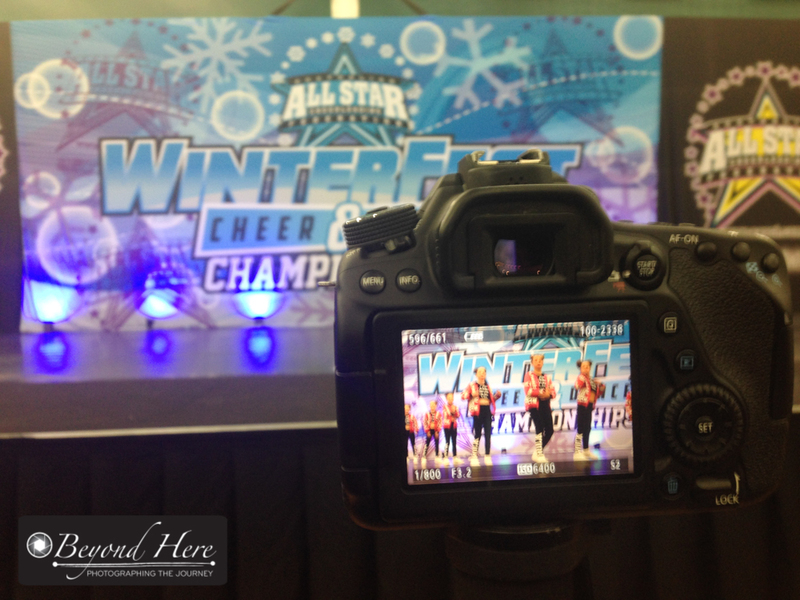 All photographers will shoot the spectacular tumbling runs in the floor routine, but it is the unique details around the competition which will make your coverage of the event stand out. Look out for these opportunities to shoot unique content. It is this detail that spectators can’t see from their seat in the grandstand. Below is a unique image where I’ve managed to create the illusion of a headless gymnast! This was taken during the floor routine during one of the gymnasts tumbling runs. If you look carefully you’ll see that the gymnasts head is not visible except for a tiny part of her chin. This kind of image is unique as you can’t see this with the naked eye. Your best chance to achieve this type of shot is with high ISO, fast shutter speeds, and shooting in burst mode. When I looked at this image on the back of my camera during the event and was amazed to see the illusion of the headless gymnast. I thought that was very unique – but then managed to produce the same type of image with different gymnasts. And the more I studied their floor routines, the higher my chance of recreating this shot. Pay attention to what the athletes are doing, and then shoot in burst mode at fast shutter speeds. The spectators sat on the sides of the main gymnastics floor which meant it was straightforward to shoot images with the crowd in the background. I like that style of image as the presence of the crowd helps define this event as the national championships not a local club event. At the ends of the gymnastics floor were large black curtains to separate the warm up area from the main arena. I hadn’t expected to be able to isolate the gymnast against plain backgrounds like this. It was fun creating different styles of images against different backgrounds. 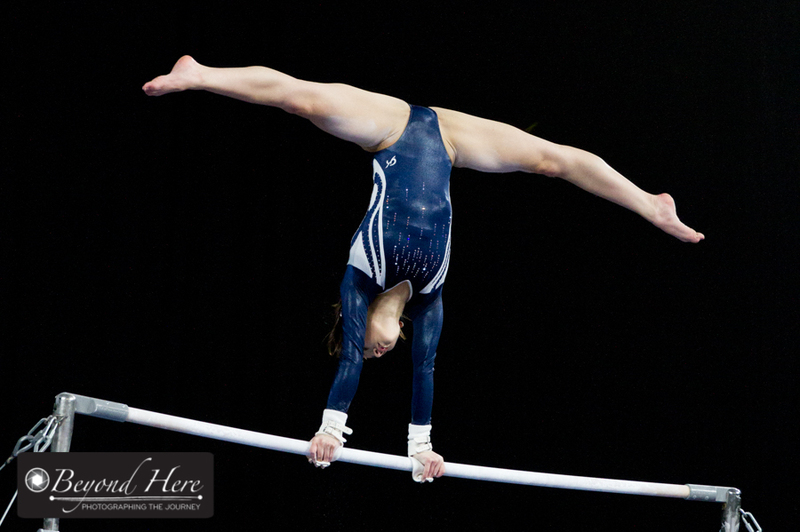 Lesson 9 of my 5 more lessons from photographing gymnastics is to use different backgrounds to create different images. Is this something you can use in your sports photography? This image was shot during the warm up phase with athletes and coaches behind the apparatus waiting for their turn. I shot a range of images where the other people were visible in the image – it documented the event as it happened. I then experimented with different angles and lenses to create different styles of images. I like this low angle perspective. We have no distracting people in the background. What are we left with? An athlete doing her warm up, isolated against a plain black background. What the spectators saw from the stands was a lot of activity on the floor. What I saw in this image was like the athletes perspective – oblivious to all the activity around them and focused on their own performance. Experiment with angles to create different images. 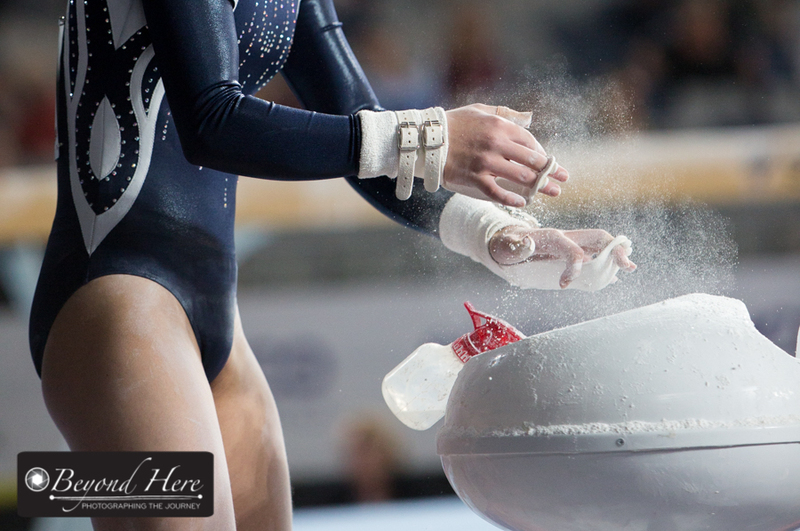 Thanks for reading 5 more lessons from photographing gymnastics. I hope you can apply them to your own sports photography. 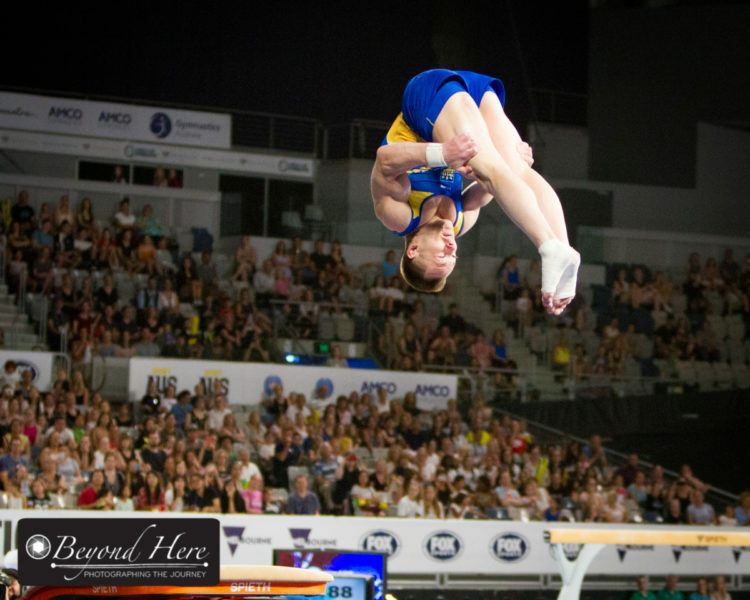 If you’d like to learn more about gymnastics check out the Gymnastics Australia website. This entry was posted in Photography Tips, Sports and tagged gymnastics, sports, sports photography on June 11, 2018 by Craig Dingle.